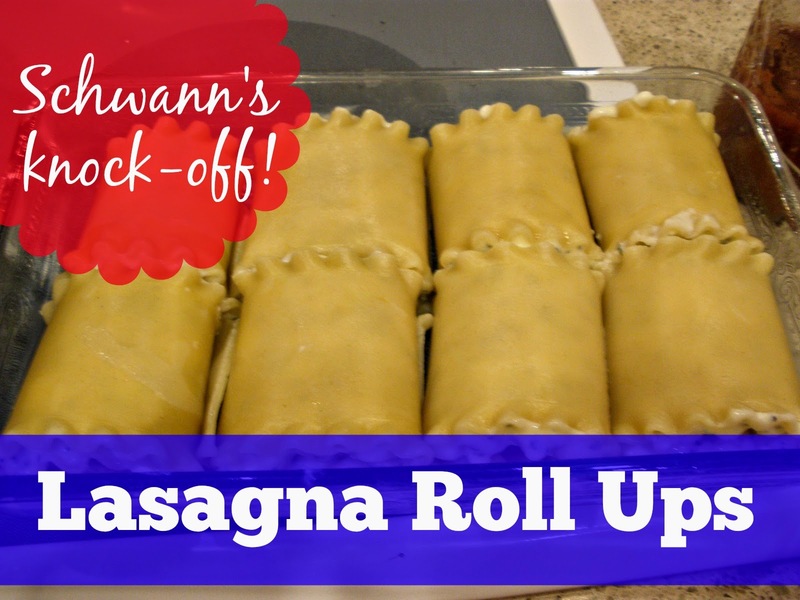 The Sustainable Couple: Schwann's Lasagna Roll Up Knock Off. Schwann's Lasagna Roll Up Knock Off. This post was originally published in December of 2011. I thought I would share it with you for two reasons. First, I think you know that John and I are pretty average, real people. And, you know we love our Schwann's man. Once a month (formerly twice a month), he visits our place and we buy some ice cream treats for our freezer. We find that although these aren't super healthy, all-natural snacks, we save a lot of money this way rather than visiting the DQ down the street a few times a week. Second, it's pretty cool to take advantage of certain grocery home delivery services, while also saving money by making some of the items yourself at home. As I was flipping through this season's catalog, I saw this lasagna roll-up. MMMMMMMM...it looks SO DELICIOUS, doesn't it. All that ricotta cheese, a splash of pasta sauce, spices. Lordy. So, as directed, I flipped to page 35. Lo-and-behold, the Lasagna Roll Ups were $8.25. Ok. A little steep, but not bad, I guess. Wait a minute. That's $8.25 for FOUR Lasagna Roll Ups! And they don't even come with the pasta sauce! Screw that. I'm makin' my own, baby! Join me in the kitchen, please, while I take you through my Saturday morning of making a more affordable, but equally tasty lasagna roll up. Get some regular 'ol lasagna noodles and cook 'em. I cooked a whole package, since I was making a pan for John and I, and two pans for the freezer. While the noodles were cooking, I whipped up the filling. I read the Schwann's catalog description of the filling and made my own, containing: Ricotta cheese, cottage cheese, basil, parsley, eggs, and garlic powder. Ok. Noodles are done and drained, so lay 'em out on a cutting board. And then spread some of your cheese mixture on the noodles. Leave about an inch and a half open on one end. Begin to roll up the lasagna toward the empty end, since the filling will smush it's way down to the empty end. Pack your noodles into a pan. And cover your noodles with home canned pasta sauce from your summer garden. What? You don't have home canned pasta sauce? Then get yourself a little garden! Boom. Since a package of lasagna noodles yields a lot of, well, noodles I made a small pan for the freezer. A disposable bread pan was the perfect size for four lasagna roll ups. I ran out of filling after the first pan, so I whipped up some more, but added slightly less garlic powder. Ta da! Three pans. One for dinner, and two for the freezer. Perfecto! Do you partake in a grocery home delivery service like Schwann's? Do you have any knock-offs or money savers? What conveniences are you NOT willing to kick to the curb? These make me think of canelloni. Have you ever tried making those? It's on my someday soon list of experiments. Looks good Kelli - all my kids seem to like lasagna! Do it the real food way, sister!